The concealment version of the Safariland SLS System holster offers the added safety of a rotating hood and holster tensioning device. 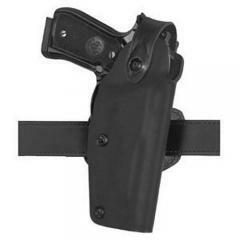 Lightweight and durable, the Safariland 6287 holster is a top draw with a slight forward cant. Features a Fine-Tac Finish, suede lining and belt slide. Available in black. Comes standard with the 1.50" & 1.75" combination belt loop. Known around the world for their law enforcement products, Safariland is taking the knowledge gained to manufacturer holsters and accessories into the civilian market. Safariland never fails! Top of the line quality.